The story today is partly about what we didn’t see. That means just one thing: We’ll have to walk the Camino again to see what we missed. It was still dark when we left Azofra. We were following the beam of our headlamp and the lights of other peregrinos’ headlamps up ahead. As a result, we missed the ruins of a medieval pilgrims’ fountain. 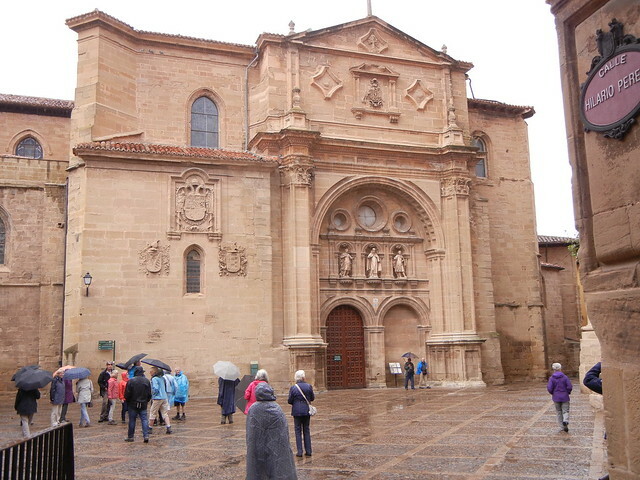 We also missed seeing the Cistercian Abbey of Santa Maria founded in 1170 and the San Millan Yuso and Suso Monasteries which are UNESCO World Heritage Sites and the birthplace of the Spanish language. Taking the detour to those sites meant adding one more day to our journey. We figured that walking 800 km was far enough! The other thing we missed seeing was the interior of the cathedral in Santo Domingo which houses the tomb of Domingo Garcia, the saint that the town is named after. There is a chicken coop at the rear of the church that contains two live fowl – an odd feature for a church! The chicken coop relates to a legend of a pilgrim called Hugonell who was walking to Santiago with his parents. The three of them decided to rest at an inn in Santo Domingo de la Calzada. The owner of the inn´s daughter immediately fell in love with Hugonell, but her feelings were not reciprocated. The girl was angry and she placed a silver cup into his luggage, accusing the boy of theft. Thieves at that time were punished by hanging, and this was the fate of Hugonell. His parents, saddened by his death, continued the pilgrimage and, upon arriving in Santiago de Compostela, began their return journey to visit the grave of their dead son. When they arrived in Santo Domingo, however, they found their son still hanging in the gallows but, miraculously, he was still alive. Hugonell said to them: “Santo Domingo brought me back to life, please go to the Mayor´s house and ask him to take me down”. So Dave and I missed seeing the medieval pilgrim’s fountain, the Cistercian Abbey of Santa Maria, the San Millan Yuso and Suso Monasteries, and the interior of the cathedral in Santo Domingo. What we did see today, absolutely made up for what we missed! Once again we were walking on a natural path, far from the highway through gently undulating farmland. We walked mostly alongside vineyards during the first few kilometers and then through a patchwork of farmland with mostly plowed fields. A rainbow appeared letting us know that we would be in for a bit of rain. It was just a sprinkle, but we got out our rain gear just in case the sprinkles developed into something more serious. Let’s zip back to the beginning of our day. When we left Azofra in the dark, we assumed the peregrinos ahead knew the way to go and we blithely followed them. Eventually the leaders stopped until we caught up and asked if we knew we were on the right path or whether we were just following them. Oops! St. James just must have been looking out for all of us because, luckily, we were going in the right direction. We didn’t eat breakfast before leaving Azofra. By the time we reached the first town, Ciruena, after walking 9.2 km., we were famished! Ciruena looked like a ghost town with no cafes in sight. There was a golf course with no golf players. There was a big club house along side a maze of empty apartment blocks with many “Se vende” (for sale) signs in the windows. 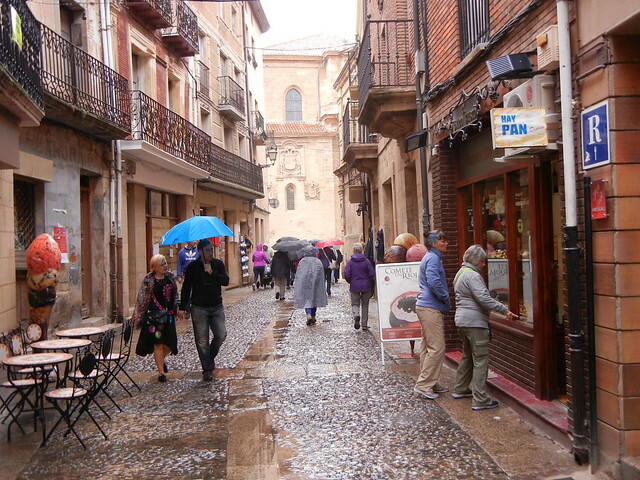 We were worried that there would be no place to eat in Ciruena and we would have to walk another 5.9 km to Santo Domingo de Calzada. We were already dragging ourselves because we were so hungry. 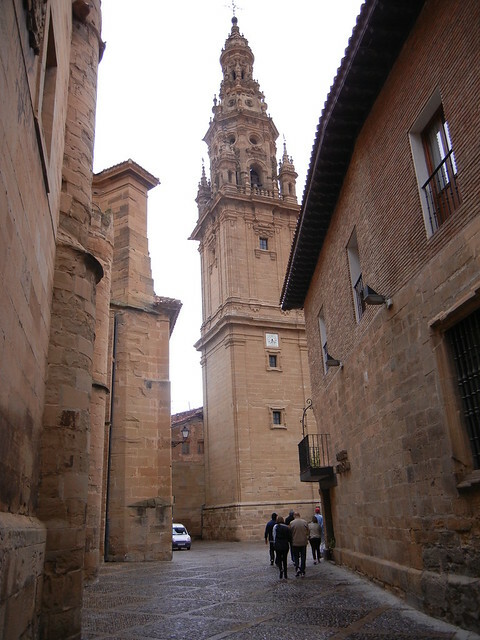 Could we drag ourselves all the way to Santo Domingo de la Calzada – a total of 15.2 km before eating? Hardly! Rather than feel sorry for ourselves, though, we had to remind ourselves of all the people in the world who have to go longer than fifteen hours without food, perhaps like the migrants from Syria who are walking to a better world in Europe. When we finally found a cafe on the outskirts of Ciruena, it was like finding an oasis in the desert! We wolfed down a big breakfast of cafe con leche, ice cream, orange juice, and a big cheese-filled bocadillo. 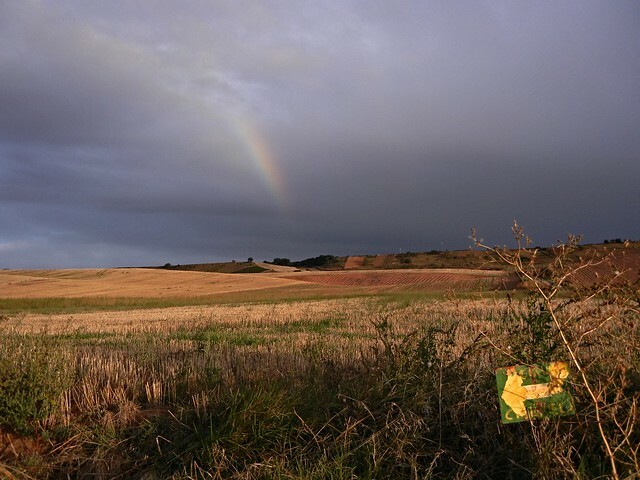 This will be of interest to Tania who had a strong connection with “The Wizard of Oz” on her Camino journey: the yellow brick road, red sandals, and “Somewhere Over the Rainbow.” We are only 13 days into our Camino journey and already we have a connection (albeit remote) with “The Wizard of Oz!” We have bumped into Jen and Grace several times since Puente La Reina, and guess where they are from! Kansas!!! The same place where Dorothy from “The Wizard of Oz” got whipped up into a tornado! Well, I said it was a “remote” connection. LOL! P.S. Here is just a little bit more about Domingo Garcia, Saint Dominic of the Road, for whom Santo Domingo de la Calzada is named after. He dedicated his life to improving the physical route for pilgrims. He built many of the roads and bridges that we pass along. They were built in the 11th century, so they have been rebuilt several times since then. He built a pilgrim hospital which is now the Parador Hotel as well as the church which was consecrated in the 12th century. An independent tower was added in the 12th century. Gotta love Osprey’s plastic rain covers for backpacks, Judy! Maybe don’t start in the dark with headlamps? We got lost in the Grand Canyon one morning and had to backtrack until dawn showed the way. What a great blog you’re writing! I’m spellbound! I got your link from Norm and Laurel when we were in Lunnenburg a week ago. Your walk is arduous and interesting. Your photos make the journal all the better. Definitely trip of a lifetime. You know what’s funny? I didn’t get what all those Sevende signs were…for a while along my journey. At the time I wondered, “Wow, who is this “Svende” guy? He’s certainly popular across Spain.” Lol! Duh. Another pleasure to read. I think I have missed #13, so will backtrack. I am kindly smiling when I hear in your tone just how thrilled you are to be doing what you are doing. I remember hearing so much apprehension before you set out. You are making many of us envious, but also inspired to perhaps do it too! 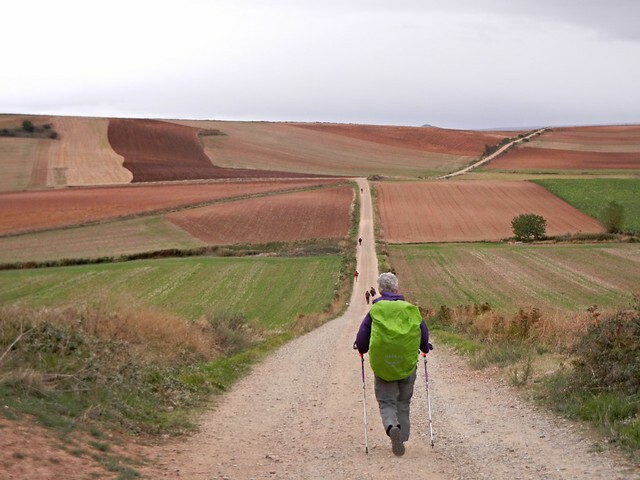 Hi Judy & Dave, I am captivated by your online Camino blog. Thank you so much for your pictures & historical details.